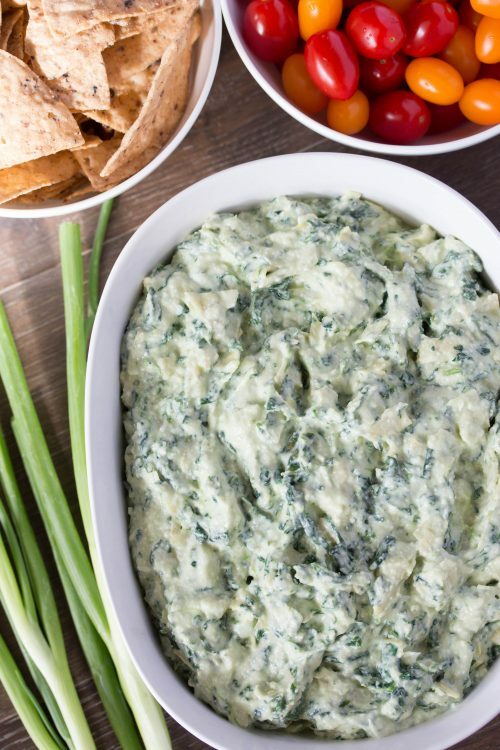 Who doesn’t love a creamy, warm spinach and artichoke dip?!?! 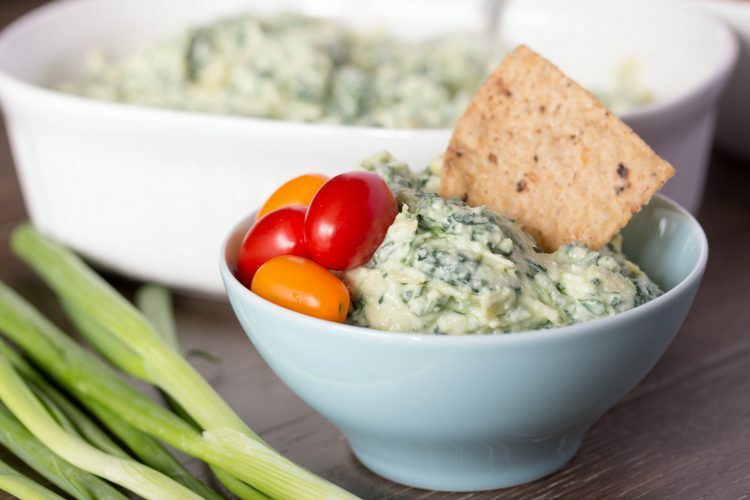 This will forever be a party staple… why not make it a little healthier? Healthy does not have to equal bland and flavorless. Creating something healthy includes healthier substitutes, quality ingredients, and utilize the natural goodness from fruits and veggies. 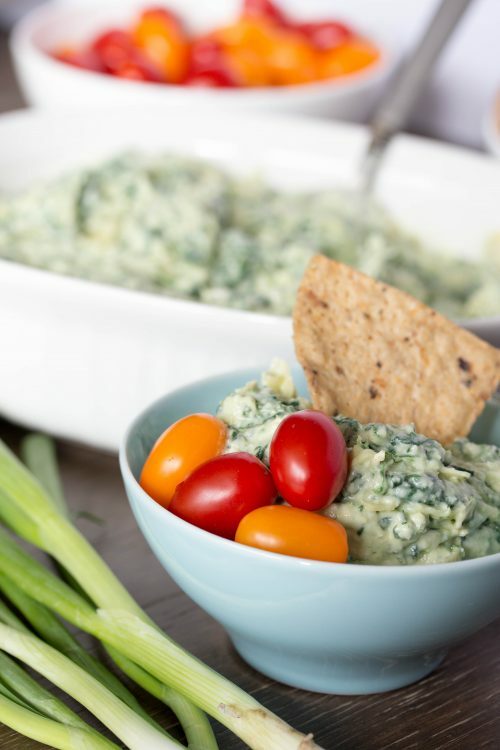 No fruits in this dip BUT we do throw in a few vegetables creating this savory cheesy easy spinach dip. I’m a huge fan of organic. Yes, organic has lots of health benefits by avoiding chemicals, growth stimulants, antibiotics, or pesticides. However, I must admit one of my main motivators for purchasing organic is the FLAVOR. For me, there is a clear contrast of flavor between organic and non-organic. Organic tastes like fresh produce plucked from your very own garden. Although I don’t specifically state organic items on the recipe, I strongly encourage you to purchase organic ingredients to enhance the taste. You will not regret it! 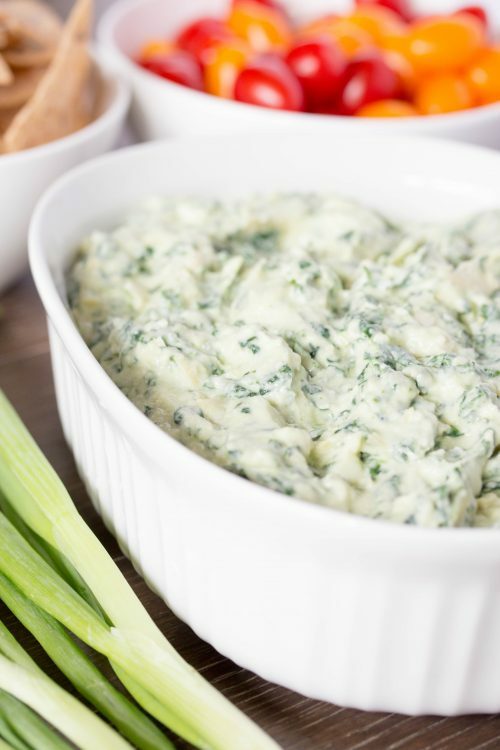 Here are some of the products and ingredients we recommend using to make this recipe deLISH! 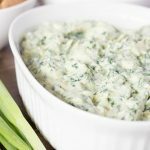 Creamy, savory, and flavorful Easy Healthy Spinach Artichoke Dip Recipe will become a go-to party recipes! In a quality blender, add onion, jalapeño, avocado, yogurt, mozzarella, parmesan, salt, and garlic. Blend until smooth for about 45 seconds. Pour mixture into 8x8 glass baking dish. Carefully stir in artichokes and spinach until mixed and combined evenly. Bake covered for 30 minutes or until dip is bubbling around the sides. Want even more spice? Add one more jalapeño with seeds (2 jalapeños total) for a nice and spicy dip.